Coffee is a staple in our house. 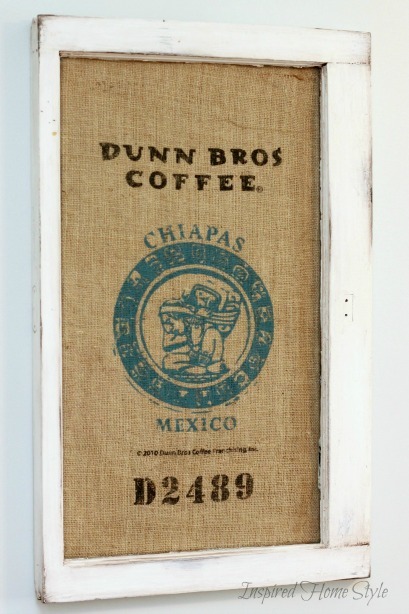 It only seems natural to have framed coffee sack art hanging in our kitchen. When I discovered that one of the coffee shops near us gave their coffee bags away…well lets just say…I was beyond excited! 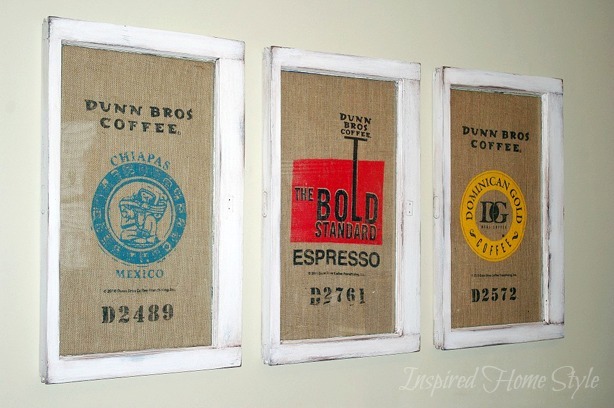 The coffee bags are graphic/gorgeous and perfect for turning into framed art. I actually only started drinking coffee a couple of years ago. Now…well lets just say, our budget for coffee has gone up significantly since I became a fan. I don’t put anything in it, just strong black coffee. It is what gets me going in the morning and what keeps me going all day. 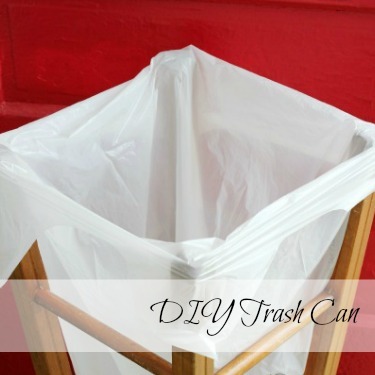 That is why this simple project is so perfect for our house! There is a technical way to frame art…and this is not it. I am sure there are people cringing as I tell you to tape everything together. Well that is how I roll. Quick, simple and easy. I was able to use things we had around the house, meaning I could finish this project in an evening. Totally win in my books! Vintage wooden Window ~ we found ours in abandoned in an alley. Love it! I love that we made this simple art for basically nothing! Frugal and beautiful. I love the look of distressed, painted wood, so these little windows fit my needs perfectly. 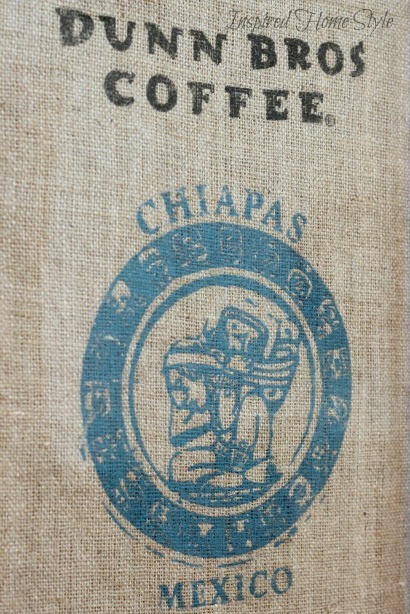 I tackled the coffee sacks next. I cut along the seams of the sack and set the back burlap fabric aside to be used for another project. The burlap had a lot of wrinkles so I carefully ironed the back side. Next I cut a large piece of cardboard to fit inside the window. 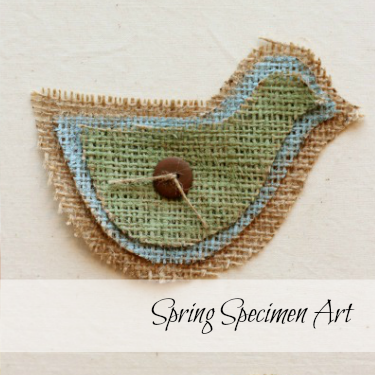 Your burlap piece should be about 2 inches larger than the cardboard on all sides. 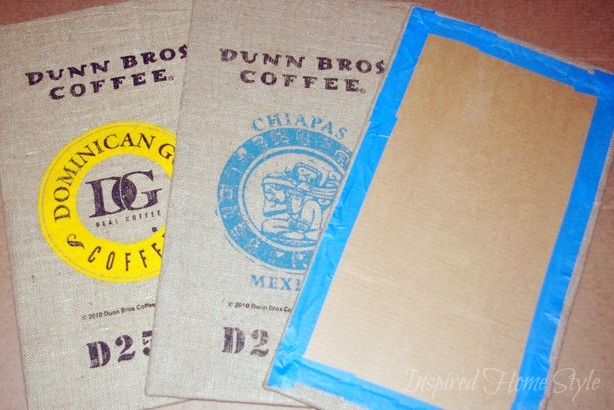 Spray one side of the cardboard with spray adhesive and lay your burlap coffee sack on top printed side up. Gently stretch the burlap until the image is exactly where you want it. Flip the cardboard over. Tape excess burlap to the backside of the cardboard creating a finished edge. Why not make a couple a few. They make a simple frugal gift as well. 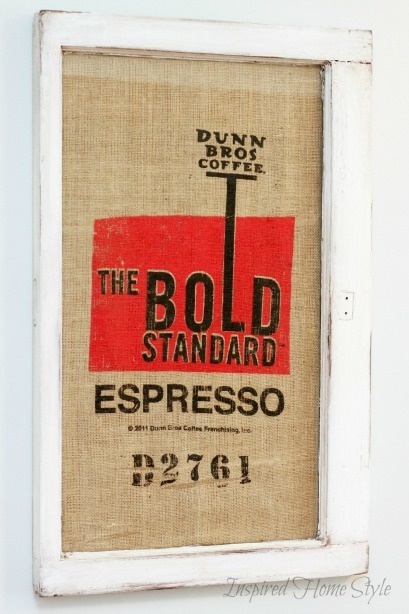 I love how the burlap looks framed with a vintage window. A match meant to be! This entry was tagged Burlap, Wall Art, Windows. 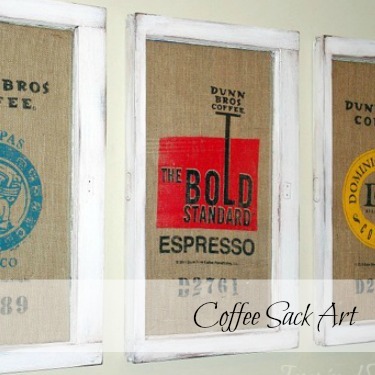 Love the coffee bags- mind if I ask what coffee shop you got them at? We got ours from a local Dunn Brothers coffee shop in Minneapolis. 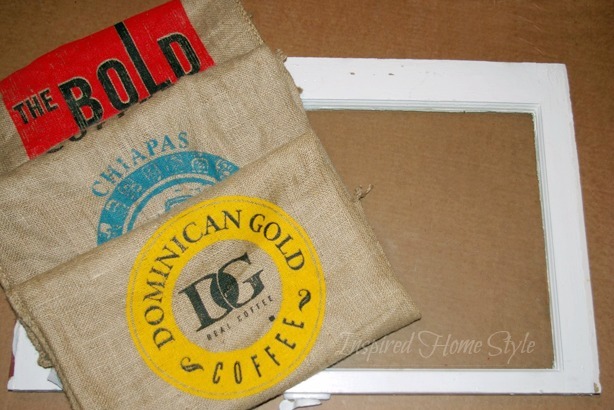 I have seen a few people selling coffee bags similar to this on Etsy. Love to hear if you find some. Thanks for stopping by!